Learning to dive involves learning a new set of skills. Mask clearing, buoyancy control, regulator recovery and all the other skills that you learn on an open water course are essential for dealing with the underwater world. As a diver progresses through diving they learn additional skills such as using a drysuit, wreck diving or how to rescue their buddy. With technical diving there are again some new skills that need to be learnt. In addition with technical diving there is a greater focus on ensuring that skills are not just learnt but also practiced and mastered. The reason for this change in emphasis is that decompression diving introduces what is known as a virtual overhead environment or glass ceiling. This increases the risks of the dive but also increases the consequences should there be a problem. On a recreational, or no-stop dive, the surface is only a few minutes away, and should the diver have to ascend immediately due to an equipment problem, there would be relatively little risk. On a decompression dive, the diver cannot ascend without risking decompression illness. The diver may need to perform an hour or more of decompression before they can safely reach the surface. As a result, they must be able to deal with any situation that may occur. They must also be able to complete the correct decompression for the dive they have carried out. This means following a specific ascent rate and holding decompression stops even if other things are happening. This can only be safely done if the relevant skills are practiced and mastered. Buoyancy control is the essential skill that is fundamental to all diving. Most divers go through a number of stages in achieving buoyancy control. At first, when they are initially learning, they have little to no control. They don’t understand how to change their buoyancy or the factors that are affecting whether they are rising or sinking. By the time they achieve their open water qualification, they should have moved to the second phase where they understand how to control their buoyancy but it is an ongoing effort. They may have their hand on the BCD control constantly and have to make a conscious effort to control it. After further practice, they reach the third stage where buoyancy control is now automatic. They can swim around maintaining buoyancy with little to no obvious effort and are able to maintain a good level of buoyancy control providing everything is going well. Most divers only ever reach this third level of control and many experienced divers who are considered to have good buoyancy control are at this level. However, if a problem occurs, or their attention is focused on something else then that buoyancy control starts to become more erratic. Unless a diver has experience of dealing with problem, they are unlikely to be able to maintain their buoyancy whilst at the same time dealing with the problem. Technical divers must reach the fourth stage of buoyancy control where they can deal with one or more problems whist still maintaining their buoyancy. Once the technical diver has achieved this point, they can focus on solving the problem at hand. This level of control provides a stable platform for all of the other skills required for technical diving. Controlling the ascent rate is one of the key skills of technical diving. This type of diving almost always means decompression diving, and so a controlled ascent rate is essential. Decompression tables or computers are based on a given ascent rate, and it is essential that the diver sticks to the correct rate. Not too fast and not too slow. There has been a gradual movement towards slowing down ascent rates, and for recreational diving, this can only be a good thing. For technical diving, it is slightly more complicated. Many recreational divers who move to technical diving end up ascending far too slowly at depth but then too quickly from the last decompression stop. This is the exact opposite of what they should be doing. If the diver ascends too slowly, they may in effect extend their bottom time and end up incurring more of a decompression penalty. For this reason, the technical diver should always ascend at the correct rate. This doesn’t mean fast but just means at the rate prescribed by the decompression model they are using. Many decompression models use an ascent rate of ten meters per minute from the bottom up to the first decompression stop. Once the diver reaches their decompression stops, they need sufficient buoyancy control to be able to hold these depths. For a safety stop, it is not essential that the stop is made at exactly the prescribed depth or that the diver maintains exactly that depth for the whole of the safety stop. However it is a different story for a mandatory decompression stop. The diver must now be at exactly the depth required. Any deeper and they will not be releasing the gas that has built up in the body fast enough, but any shallower, and they may be releasing it too fast, possible resulting in decompression illness (DCI). For this reason they need to maintain their stop depth plus or minus no more than half a metre. Clearly good buoyancy control is essential here. On most technical dives, the diver will switch from the gas they were breathing during the bottom part of the dive to a separate decompression gas. This decompression gas will speed up the rate at which dissolved gas is released from the body and reduce the length of the decompression stops. The gas used during decompression is a rich Nitrox mix. The danger with using these gases is that if the diver drops below a certain depth there is a risk of central nervous system (CNS) Oxygen Toxicity. In order to safely use these gases, the diver must be able to maintain his depth and ensure they do not drop below the maximum operating depth for the gas. If more than one decompression gas is carried, each will have its own maximum operating depth (MOD). The diver must ensure that he does not switch to the wrong gas at the wrong depth and risk CNS Oxygen Toxicity. For all of these reasons, the diver must be able to carry out their gas switches ensuring that they always switch to the correct gas whilst maintaining their depth to within half a metre. During the gas switch, it is essential that your buddy checks that you are switching to the correct gas. This is just one example of the level of buddy skills required for technical diving. 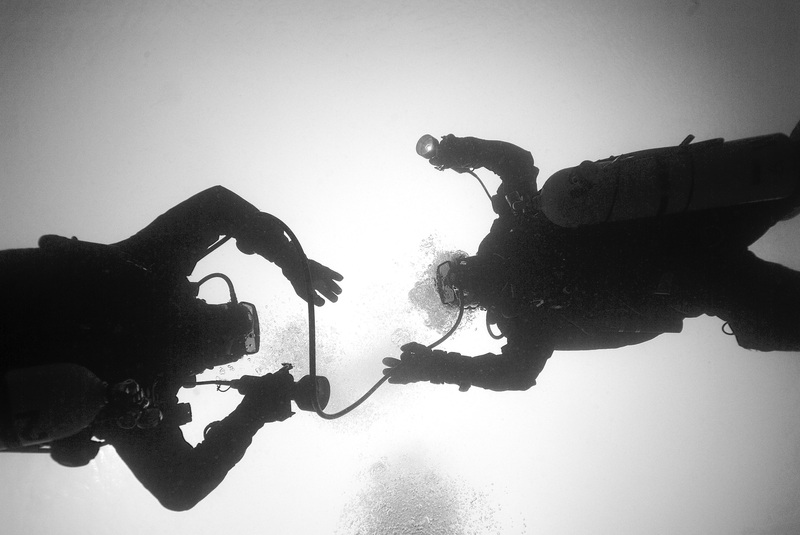 The technical diver should always be aware of their buddy and work as a team to anticipate and avoid potential problems. It is all too easy to focus exclusively on the task you are carrying out and forget about your buddy. No matter what you are doing, you should always be aware of your buddy and be ready to assist if they have problems. The worst case situation is if your buddy runs out of gas and has to share your gas supply. This indicates a serious lack of planning or awareness, as the technical diver should plan their dive and monitor their consumption to ensure that they never run out of gas. If the worst case does happen and your buddy runs out of gas, then you will need to perform an ascent, carrying out any decompression stops, to the surface or to the point where you can switch onto one of your decompression gasses. In this case, a long hose on the regulator you donate to your buddy will make this task much easier. Rather than being just a few inches from each other, a long hose allows enough room between the divers to enable a comfortable ascent and decompression stop. Again this is a situation where buoyancy control is essential if you are to ascend and hold your decompression stops whilst simultaneously sharing gas. Using a Delayed Surface Marker Buoy (DSMB) is a common occurrence on technical dives. Returning to a shot line at the end of the dive is not always desirable, and strong currents decompression on a shot line can be an uncomfortable and potentially dangerous option. Procedures vary from one region to another, but the most common method of decompression in the UK is to send up a DSMB from the wreck or near the start of your ascent, and then drift with the current. With a long decompression, the DSMB allows the boat to track the drifting divers, even in a strong current. A DSMB makes long decompression stops easier for the diver by providing a depth reference. For these reasons, it is essential that technical divers practice sending up a DSMB until they can do it easily. For deeper dives, it is sometimes the case that the DSMB is not long enough to reach from the maximum depth to the surface. For this reason, it is also important for technical divers to be able to deploy a DSMB from a decompression stop or whilst ascending from one stop to another. In order to do this, it is essential that the diver has mastered both skills individually before combining them. As well as their DSMB, the technical diver should also be familiar with all of their other equipment. In the case of a problem, they should be able to easily find and use any piece of equipment. If a diver carries a piece of backup equipment but has never practiced using it, there is no guarantee that it will work as expected when needed. Many divers carry a backup reel and DSMB but very rarely practice using them. If the main reel has a problem, that is not the time to be trying to remember how the backup works. Similarly many divers carry a backup mask but have never practiced getting it out and putting it on in the water. If you loose your mask, that is not the best time to find out that it is very difficult to undo the pocket that holds your backup mask. It is for these reasons that technical divers frequently practice key skills. The thinking behind this is that if an emergency happens then the worst time to be trying something for the first time is when you need it for real. Equally, if you have not practiced a skill for a long time it is likely to be rusty. The reason we practice these skill is not that we think it is likely that we will need to perform that skill regularly. Quite the opposite, they are practiced because it is hoped that we will never need to use them, but if we do, we will be able to carry out the skill without a problem. For example, many technical diving courses include practice in removing the stage cylinder containing your decompression gas and then refitting it. This is not because we anticipate taking it off regularly, there are very few times when you would want to take off a stage cylinder. However, if the diver gets a line tangled around his stage cylinder, or needs to pass off the stage cylinder to his buddy, it will be invaluable if they have previously practiced this manoeuvre. Technical diving builds on the key skills that are required at any level of diving but as we can see there is more of an emphasis on practicing and mastering each of the skills. The implication of not having mastered a skill in technical diving is potentially more serious than in recreational diving, but regular practice of skills and planning for the worst case is something that is very useful at all levels of diving.